As soon as temperatures drop, nothing feels more right than setting out for some much-needed relaxation in a quaint cabin. Life, however, isn’t always the Nancy Meyers movie we wish it was, so packing up to visit a wintertime retreat isn’t always possible. You don’t have to live in a remote, rural abode to make the most of a season when huddling up by the fire is of utmost importance, but by borrowing a few cabin design tricks, you can maximize the coziness of your space. That’s why we asked the owners of Airbnb’s coolest cabins how they made their interiors so inviting. Cabin style can come in all shapes and forms, from minimalist to bohemian to classic, and these four cabins across the country attest to that. No matter what your taste may be, these styling tricks are sure to give you a few ideas you’ll want to use in your home, stat. Friends and co-owners of Black Bear Ridge—a quaint four-bedroom cabin in the Catskills—Kate McCann, Amanda Jaffe, and Carina Romano turned their once-outdated property into a perfect year-round hideaway. Mid-century furniture lends the space a vintage-meets-contemporary appeal, while plenty of Pendleton blankets and colorful, Southwestern-inspired textiles bring in a bit of rustic flair. How do you give a space a cozy, lived-in feeling? Have as many blankets as possible. Trying to create cozy nooks in every room was one of our biggest goals. Since initially decorating the house, we’ve added a daybed, floor pillows, and a bean bag to make cozy a no-brainer. Different lamps and dimmable overhead options are also helpful for setting a cozier mood. Go-to places to buy decor? 3Potato4 for adorable pendants and keychains for our house. Alegria Home is where we got a beautiful basket and pillows. Our mid-century modern chairs are from a local (to us) Philadelphia mid-century warehouse. The handmade antlers and a sweet bird vase are from Kabinett & Krammer, a truly amazing antique and art shop over in Andes, NY. We also got our daybed and master bedroom dresser from Final Cut New Jersey, an Anthropologie warehouse store with great deals. Our living room weaving is from The River Haze shop on Etsy. Small details that make the biggest difference? We’ve hidden a lot of small animal details around the house. There’s a black bear bottle opener, a brass rabbit towel hook, some little cat trinkets, a cat in a button-down screenprint—the list goes on. These little details make the house feel unique. You can see a new animal friend each time you revisit a room. Simple stripes offer timeless coziness. A touch of ikat makes pattern mixing a cinch. A bone inlay pattern turns this spacious dresser into an unexpected statement piece. 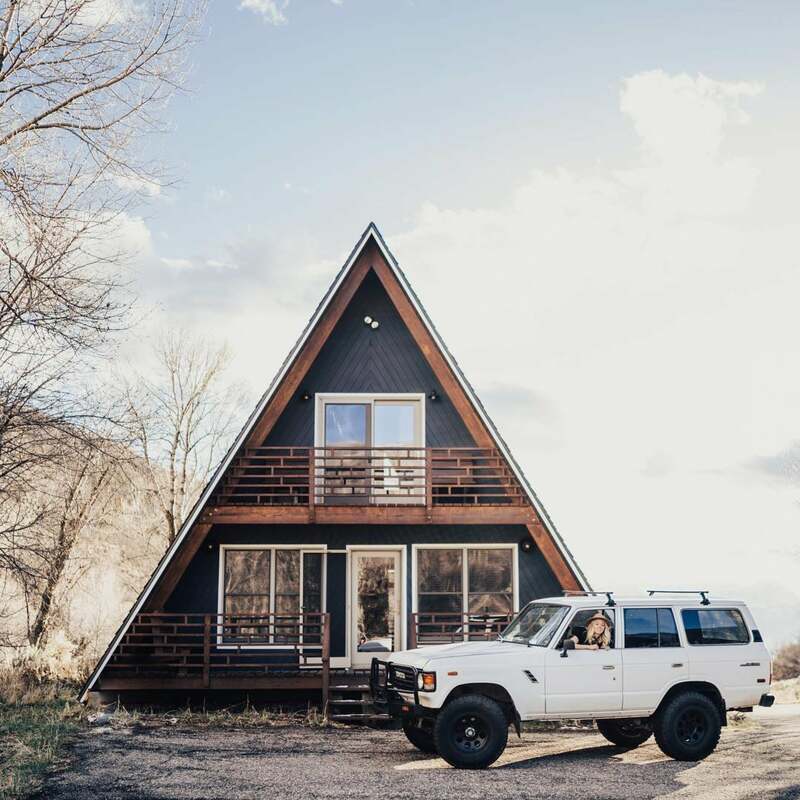 A-Frame Haus, tucked away in Herber City, Utah, was built by owner Kara Van Dyke’s grandfather in 1988, but bright white walls and a muted color palette, along with an array of simple textiles, make the space feel contemporary while maintaining its rustic charm. This is what farmhouse style looks like when mixed expertly with Scandinavian sensibilities. Having rugs in every room was really important. I actually love to switch them up as my own style shifts. Schoolhouse Electric for lighting, Rejuvenation for the prettiest rugs and barstools, McGee & Co. for baskets, pillows, and décor, Etsy for artwork, Ikea for linens and kitchen essentials, CB2 for towel hooks and open shelves, and our kitchen runner is from Pottery Barn. I struggled to find simple linen throw pillows and I really wanted some in the space, so I sourced my own fabric from a small mill in Northern Ireland and had them sewn up! It’s given the place just the touch I was looking for. The toned-down, earthy color of this patterned rug blends into an otherwise minimalist space. Courtesy of McGee & Co. When you’re working with a muted color palette, interesting textures go a long way. A gold-toned basket makes a bundle of blankets look refined. It was important to owner Liz Castellon-Nelsen that her Mount Hood cabin, Red A-Frame, kept its original ’60s charm while also looking updated and elevated. Natural tones of whites, creams, and tans complement the wooden walls, and painted mint green stairs pay homage to the ’60s green shag carpet that originally adorned the space. As a whole, the home embraces classic boho style but balances pops of color and patterns with soothing earth tones. Lots of pillows, throws, and more pillows. It’s all about comfort for us, especially for our two young kids. They love that we have so many fort-making supplies such as pillows and blankets. They look good and make any space look lived in while adding personal style. Seek and Swoon for the most gorgeous, hip and comfortable throws, Letterfolk for their stylish and inspiring letter boards, Chasing Paper for wall art and removable wallpaper, Schoolhouse for posters and prints, Sunwoven for handwoven textiles, and Urban Outfitters Home for armchairs, bedding, wall hangings, wallpaper, and more. As much as I love all the earthy tones and keeping our interior space neutral, I do love color. People are often surprised to hear that, but it’s true. I’m Mexican, and bright, beautiful color is part of our culture, so you’ll find splashes of color and patterned wallpaper throughout the cabin. We also added this gorgeous, bold black-and-white ceramic tile in our bathroom floor, and to this day, I have not seen it anywhere else but this gal’s Instagram of a restaurant in France, so we definitely feel like we made a unique choice there. This colorful weaving adds just the right of intrigue to an empty wall. Warm mustard brings warmth to any couch space. This vintage-inspired chair looks even better when covered in a sheepskin and a comfy throw. The Joshua Tree House, run by interior designers and authors Rich and Sara Combs, is filled with California-style decor that captures a feeling of warmth in spite of its desert location. Filled with natural materials (like terra-cotta, wood, leather, and wool), plants, and warm-toned textiles, this SoCal takes Southwestern style to the next level. We love to think about designing for experiences. Of course, we love an aesthetically pleasing space, but if there’s nothing to interact with, it’s only as good as a photo. The experiences in a home are what make it feel lived in: playing your favorite record, brewing a cup of coffee, reading a book, lounging in a hammock, etc. Soukie Modern for rugs, Pepe & Carols for lighting, Mercado Collective for home accessories, our local Shop on the Mesa for more home goods and furniture, Katie Gong for custom wood furniture, and thrift shops and flea markets for assorted treasures. We have a full resource guide with all of our favorite designers and brands in our new design book, At Home in Joshua Tree: A Field Guide to Desert Living. We’re big believers in always adding plants to a space—they add so much life to a home and are always our final design touch. We also love a good stack of blankets in common areas such as a living room—when there’s enough for a group of friends, we’ve found that they open a home up to intimate conversations. A simple leather pouf is a flexible room addition: It provides seating, works as an ottoman, and can even become a tabletop in an instant. High-quality wool and a simple striped-edge pattern make this pom-adorned blanket look perfectly refined. This sweet vessel can work as a vase or drinking glass, making it a versatile room element.